As you must have noticed, Kids adapt to technology very fast and there is really no way to keep them away from your iPad or iPhone. However, not all websites are appropriate for kids and you may want to block certain websites on iPad or iPhone to prevent kids from accidentally coming across inappropriate content while using your iPad or iPhone. Without any doubt a device like iPad can be a great learning tool for kids and it is a good idea to allow free and uninterrupted access to kids on your iPad, both for entertainment and learning purposes. This is how they will be able to explore and experiment with their mental capacities. 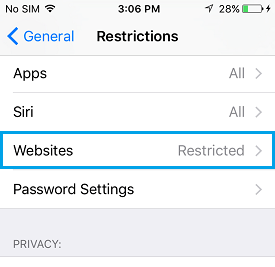 Follow the steps below to block inappropriate websites on an iPhone or iPad and ensure that your kids are using an iOS device that is set up to prevent accidental exposure to inappropriate content on the internet. Note: You will be required to set a password for restrictions, in case this is the first time that you are setting up restrictions on your iOS device. 4. Next, Scroll down until you see the Websites option. This will be way down, below all the apps that you will be seeing on this screen. 5. Tap on Websites and you will see three options. Once you select “Limit Adult Content” you will see two new fields “Always Allow” and “Never Allow”. The Always Allow field lets you white-list certain websites, whereas the Never Allow field lets you blacklist them. 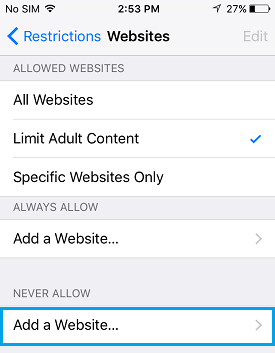 In addition to limiting adult content in general, you can ensure that certain specific websites are blocked for sure by following steps 7 and 8 below. 8. 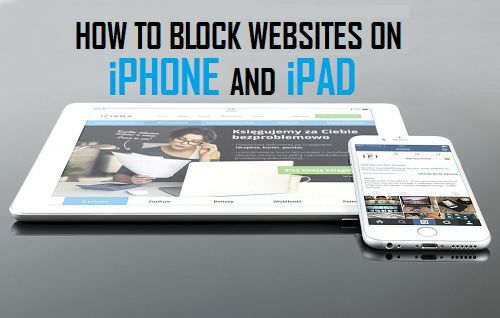 Enter the Full URL of the Website that you want to block on your iPad or iPhone. In case you want to, you can block more websites by going back to the Websites screen and tapping on Add a Website option to type in another website URL that you want to block. 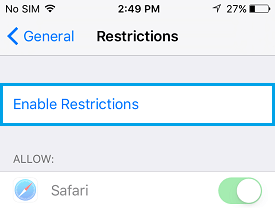 Once you block websites using the above steps, all browsers on your iOS device will obey and follow this customized setting. Even apps with their own built-in browsers like Facebook and Twitter will follow this directive, ensuring that your kids are safe from accidentally coming across inappropriate content on your iPhone or iPad. Open Safari browser on your restricted iOS device and type in the URL of blocked website. Your browser will open with a message reading “You cannot browse this page at website.com because it is restricted”. Below this message, you will also see an option reading “Allow Website“. You can tap on this link and access the restricted website by entering the passcode that you had setup for blocking websites. Another way would be to remove or delete the website from the block list by following these steps. 1. Go to Settings > General > Restrictions > Websites. 3. You will see a “–” minus icon next to the blocked website, tap on it. Note: Certain websites have mobile sites with a different URL and you may need to block them separately. For example, let us consider a website with URL “www.example.com”, it may have its mobile site as “m.example.com” and another one “t.example.com” as its tablet optimized version. In case you find that a website is not being blocked, copy its URL from the Address Bar in Safari and paste it into the restrictions window.